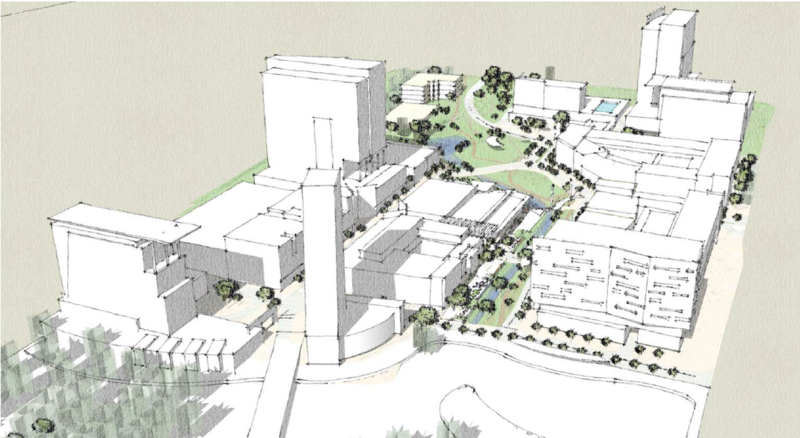 The nonprofit that manages the Research Triangle Park has announced they have secured funding that will kick off the development project at Park Center, which is the first such effort in the Park’s 56 year history. October 1, 2015 (Research Triangle Park, NC) – This morning the Research Triangle Foundation of North Carolina (RTF) announced that it has secured $50 million for the Park Center Development. These funds will allow for mobilization at the site to begin in January 2016. Park Center is the 100 acre property located in the heart of North America’s largest science park that was purchased by RTF in January 2014. That same year, the Brookings Institution named Research Triangle Park one of seven burgeoning Innovation Districts in the United States for their reimagining of the modern science park. Park Center will be the first major redevelopment in RTP’s history, and will bring together private industry, universities and all of North Carolina in an inspiring setting at the heart of the Triangle. $20 million to be allocated from Durham County to be used to build public infrastructure in the 100-acre development. $10 million from the Durham-Wake Counties Research and Production Service District for open and park space. $20 million as a result of land purchases and site work provided by the Research Triangle Foundation of North Carolina. Phase I of Park Center, which will be located on the east side of the property, is slated to include many amenities that are currently absent from RTP’s 7,000 acres. In addition to previously announced amenities such as retail and restaurants, Park Center will also include new public parks, a central marketplace, multifamily residential and hotels. The west side of the development, where The Frontier is located, is part of Phase II of the Park Center development. Durham County Board of Commissioners will make the $20 million available over the next 10 years for public projects. In Park Center, this could assist with a variety of civic spaces and public infrastructure. The allocation is structured in such a way that it will be distributed over a ten year term. The Durham-Wake Counties Research and Production Service District is comprised of an advisory committee made up of 13 members from the RTP business community and representatives from Durham and Wake counties. Companies that decide to locate within RTP do not pay city taxes, but they do pay a small tax determined by land value. The members of the service district voted to incrementally increase the tax percentage over three years in order to generate $10 million. These funds will be allocated towards open space projects within Park Center that can be utilized by park employees and community. The Research Triangle Foundation of North Carolina serves the Research Triangle Park, a bellwether institution that was once referred to by Governor Luther Hodges as the “heart and hope of North Carolina.” Situated centrally among Duke University, North Carolina State University and the University of North Carolina at Chapel Hill, RTP contains 7,000 acres, 40,000+ employees, and over 200 companies, including Avaya, Cisco, Credit Suisse, IBM, NetApp, RTI International and Syngenta. RTP is also home to The Frontier, a new community convening destination at Park Center; and The Lab, an affordable option for wet lab and office space.